Our Pomegranate Sunflower Shampoo defends color-treated hair from the damaging effects of UV rays, the environment and styling. 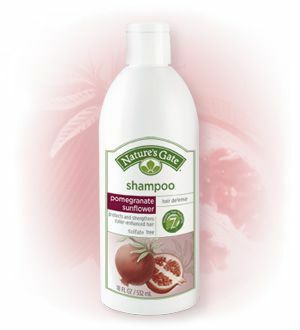 This lavish shampoo is formulated with Pomegranate, Sunflower and Red Tea Leaf for their antioxidant properties and our 7 Healthy Hair Nutrients to strengthen and revitalize hair. With daily use, this shampoo helps extend the vibrancy of your colored tresses. Water, Cocamidopropyl Hydroxysultaine (Coconut Derived), Sodium Cocoyl Isethionate (Coconut Derived), Disodium Cocoamphodiacetate (Coconut Derived), Lauryl Glucoside (Vegetable Derived), Glycerin (Vegetable Derived), Punica Granatum (Pomegranate) Fruit Extract, Helianthus Annuus (Sunflower) Seed Extract, Panthenol, Hydrolyzed Soy Protein, Hydrolyzed Vegetable Protein, Simmondsia Chinensis (Jojoba) Seed Oil, Borago Officinalis (Borage) Seed Oil, Tocopherol (Vitamin E), Ascorbic Acid (Vitamin C), Aspalathus Linearis (Red Tea) Leaf Extract, Vitis Vinifera (Grape) Seed Extract, Equisetum Arvense (Horsetail) Leaf Extract, Althaea Officinalis (Marshmallow) Leaf Extract, Salvia Officinalis (Sage) Leaf Extract, Simmondsia Chinensis (Jojoba) Seed Extract, Viola Tricolor (Pansy) Extract, Silybum Marianum (Milk Thistle) Extract, Calendula Officinalis Flower Extract, Avena Sativa (Oat) Kernel Extract, Ascorbyl Palmitate (Vitamin C), Leuconostoc/Radish Root Ferment Filtrate, Polysorbate 20 (Vegetable Derived), Hydroxypropyl Methylcellulose (Plant Derived), Sodium Hydroxide, Phenoxyethanol, Glyceryl Undecylenate (Vegetable Derived), Citric Acid (Vegetable Derived), Fragrance*.